The wine world is filled with possibilities. There are dozens of nations, hundreds of regions, thousands of appellations, tens of thousands of vignerons and wine makers, and probably hundreds of thousands of wine outlets if you count restaurants. You can add to that all of the wine knowledge, science, literature, publications, websites, bloggers, and well, it’s a lot. Can you imagine walking into a restaurant, asking for a wine from a specific label which you happen to like, and them actually having it? How is one to make choices about what to drink and when? And there are price points to consider, wine rating points (should I order a 91 or an 88? ), sometimes snooty sommeliers and wine shop employees, various vintages of differing quality, and labels, labels, labels. And those labels are on bottles with corks, bottles with screwcaps, boxes, cans, casks, and more. And by the way, how should you store that wine? Too many options can be frustrating. Oh, and what wines to serve with which foods? Which wines to sip alone? What kind of wine opener should I use? What other wine accessories should I buy? What temperature at which to serve the wine? In what kind of glass (or slipper)? Bubbly, sweet, dry, demi-sec? Port or late harvest? And ice wine! Many “experts” are just guessing. All of this can be seen as a huge obstacle to wine enjoyment, or it can be seen as a vast array of opportunities to enjoy wine. Like much of life, it all depends on your attitude. Entry into the world of wine is really quite easy. Wine is practically ubiquitous – it’s pretty much everywhere. I was just in eastern Ukraine and had local wine, some of which was delicious (LINK). One way to view the many options in the wine world and all of the different types of knowledge and skill that goes into the whole process of bringing wine to your table, is to see an opportunity for almost endless exploration. You can have a different wine every day and never repeat yourself (assuming varied wine retail options in your area and online). Another way to approach the wine world is to find a few wines that you like and stop there. I have a friend who rarely drinks anything beyond Kendall-Jackson Chardonnay; another who will only drink oaky chardonnays. Some may only drink Port wines; others Napa Cabernets. You can study broadly or do a deep dive into a narrow range of wine knowledge and experience. Most will be somewhere in between the extremes, but there is a niche for everyone. The key is not to pay too much attention to what the “experts” or the marketing forces tell you as they try to steer you toward their own preferences. Find your own way – if it isn’t interesting or fun for you, you’re not doing it right. Me, I have some favorite wines, some favorite producers, some favorite growing areas, and some favorite countries. I also like to experiment with wines I have not tried yet, but I tend to favor a known quantity with a good meal. For example, we were in Kraków, Poland recently (LINK), dining at Padre, a local Polish restaurant. 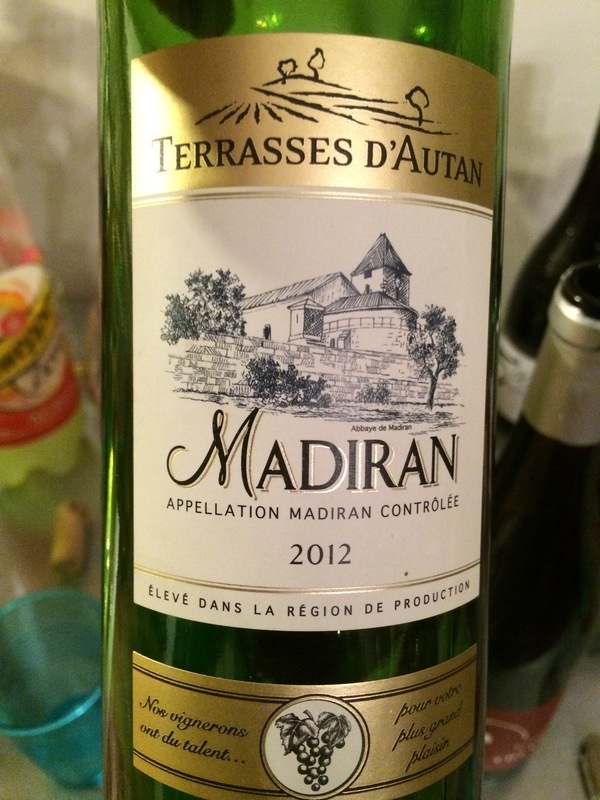 I was having lamb and noted that there was a very nice French Malbec from Cahors on the list. 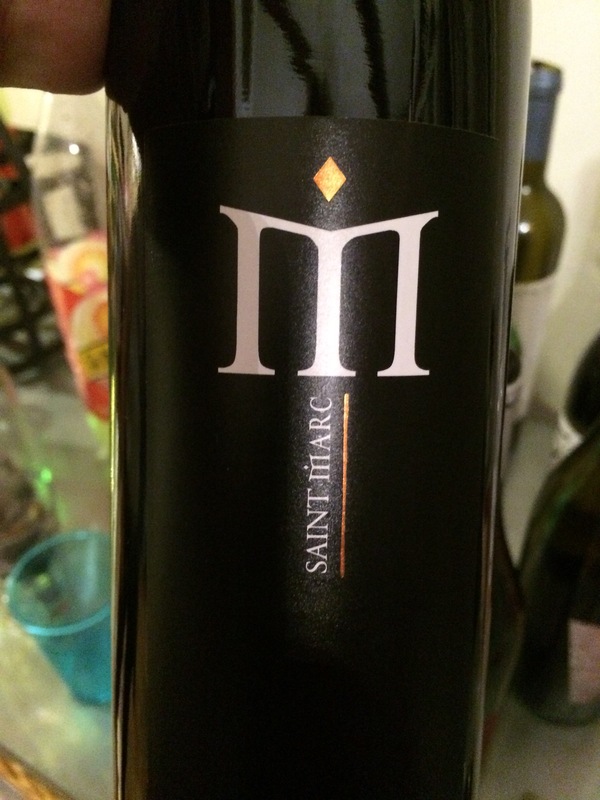 Knowing how a rich, inky Cahors Malbec would go with lamb made my decision easy – so I passed on some Polish wines. I picked a favorite over the chance to explore – that time. At other times, I will make a different decision. But that is me. You may well do something different. 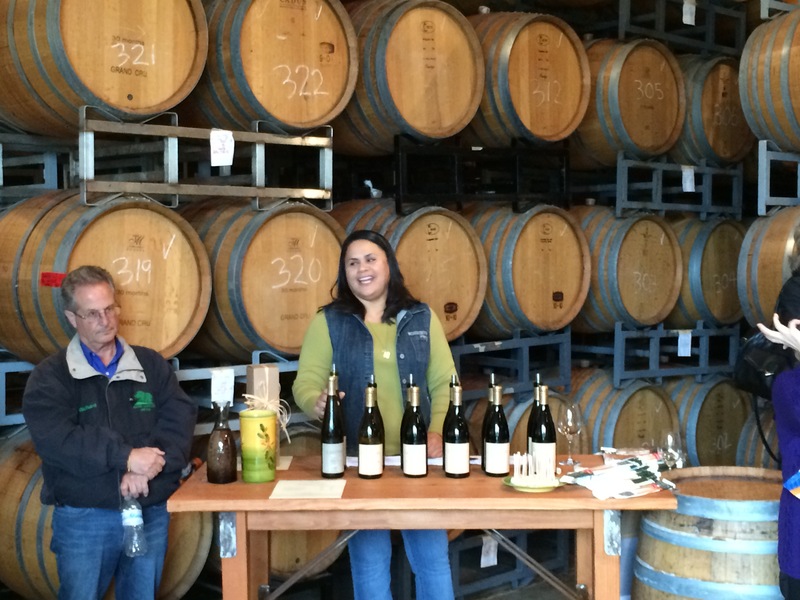 Visiting Wineries can be both Fun and Educational. My point is that the bulk of the effort in learning about wine should go into learning what YOU like about it. Then go from there. You may become an expert in Cabernet Sauvignons from the east side of Paso Robles; or you may be the go-to person for advice on Hungarian reds. Or, you may be that person who always drinks Kendall-Jackson Chardonnay. So, if you are new to wine, consider building yourself a starter case (LINK) to see what you like. Let your local wine retailer know your preferences, including if you like to try new things or stick close to what you already know. If you travel, check out the local wine scene, either in town – wine bars, urban wineries and restaurants; or head out into the local wine country to taste and explore. In an airport? Stop at Vino Volo and try a wine that you’ve never had before. Sign up for an online service like WTSO.com (LINK) and opt for something new to you. 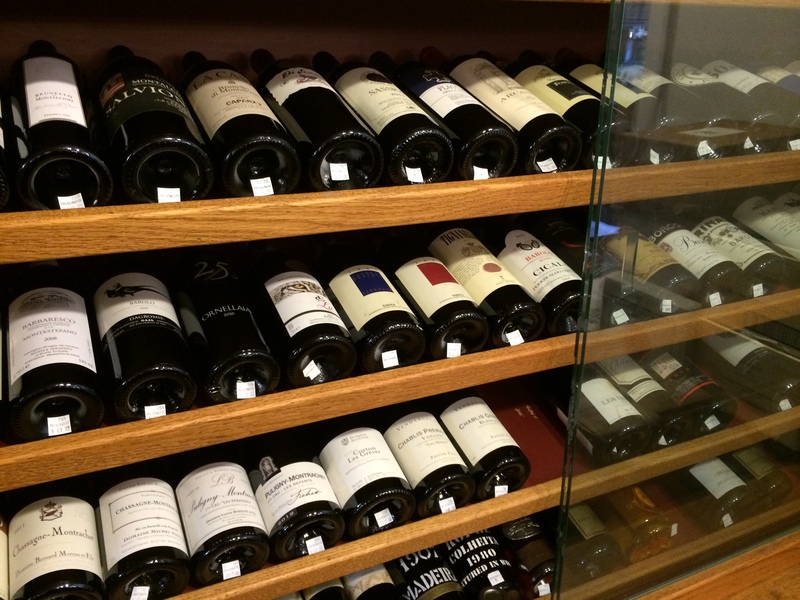 A Starter Case is a great way to find out what wines you like. Maybe you are a long-time wine consumer who is ready to spread your wings a bit. You might begin with your local wine shop – tell them what you like and ask them how you can explore some new wines that have a similar profile. Go to a Greek restaurant with good Greek wines on the wine list, and try some if that is new to you. See if there are some small producers of wines in your local area and give them a try. There are lots of possibilities. Try not to be intimidated by the experts or by too many choices. Take your time and stick to what you like – and maybe explore around the edges. The world of wine is literally at your feet. Enjoy! I went to Los Patios de Beatas on Calle Beatas the other evening to check out the wine scene there. It was recommended by Kelly Kannisto of Tannin Trail Tours (LINK) (LINK TO PREVIOUS POST), when I contacted him about recommendations for wine experiences in Màlaga. Although Màlaga is a wine region, the wines made here are generally sweet. The great dry wines of Spain are made elsewhere. Los Patios de Beatas is a combination restaurant, tapas bar, wine tasting room, wine retailer, and event location. It is beautifully appointed, has indoor and outdoor seating, and a good selection of wines, almost all from Spain, on sale. Since being in Màlaga, we have had some difficulty finding a good wine shop. I looked around the space a bit, and asked if I could do a tasting. Àngel, the head waiter told me to sit anywhere in the tasting room/tapas bar area. He and Christina made sure that I was well attended to, even though there were other customers – the exterior seating was full. The main restaurant is staffed separately. There is a Enoteca Machine that dispenses wines and keeps them at temperature. The wine list had over 15 tintos (reds) and half a dozen blancos (whites) available by the glass. Eight of the reds were in the Enoteca. 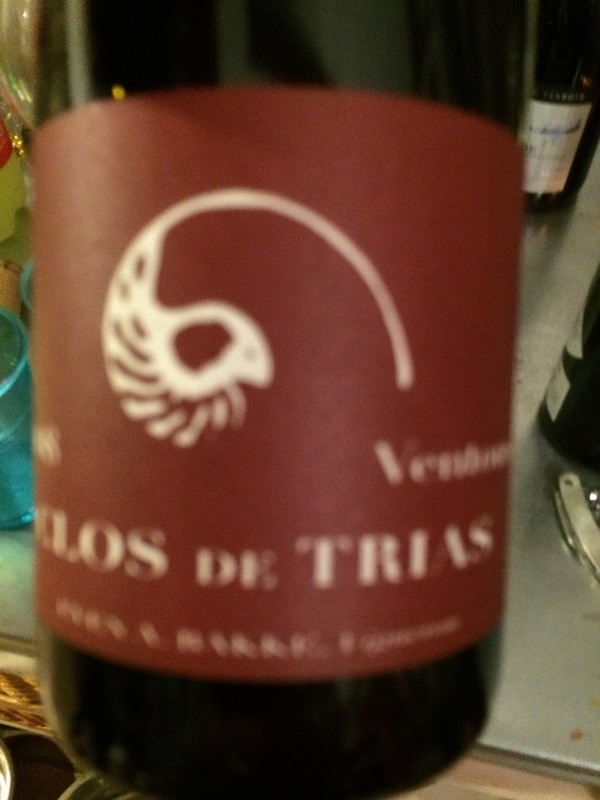 I started with a 2005 Tilenos Pagos de Posada, 100% Mencia from D.O. Bierzo (LINK) in northwestern Spain. This wine has a great minerality with hints of dark fruit, chocolate, and leather. Very nice. It retails for 33€ or about $36. Another great value from Spain. Next, I tried a 2009 Alma de Luzon, Monastrell blend of 70% Monastrell, 20% Cabernet Sauvignon, and 10% Syrah. This wine is from D.O. Jumilla (LINK), in southern Spain not far from Valencia, where the Monastrell Grape is very popular. This wine was rich and chewy, with medium tannins and a smooth finish. It retails for 36€ or about $39. 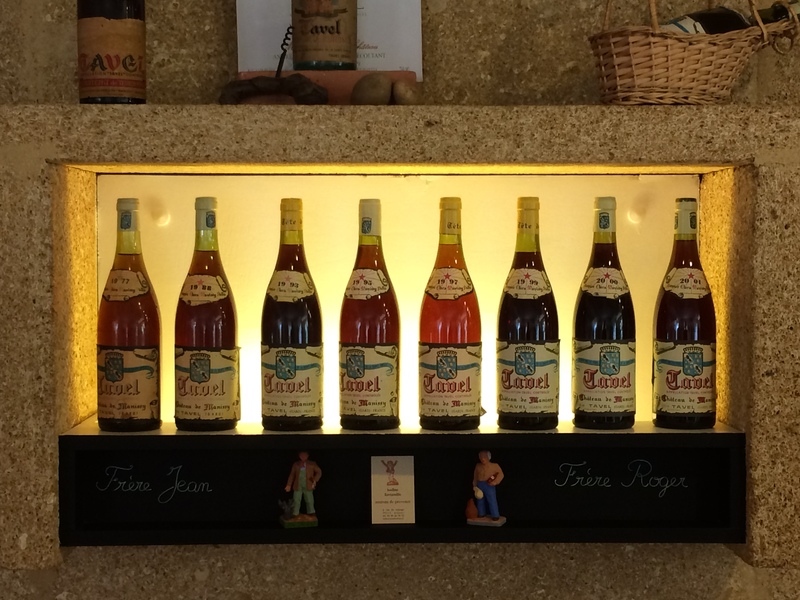 Next, Àngel brought four bottles to the table – all chilled. Three were Sherry, and one was a local Màlaga sweet wine. There were two sweet Sherries and one dry Sherry from D.O. Jerez (LINK) (LINK TO PREVIOUS POST), where Dorianne and I visited last year. I tasted these side by side while waiting for my tapas to arrive. The Màlaga sweet wine, a Trajinero (LINK), made from 100% Pedro Ximénez grapes and fortified, was semi-sweet, with a nutty flavor and a nice smooth finish. The stand-out was the Fernando de Castilla Antique Oloroso Jerez Sherry (LINK), probably the best dry Sherry I have ever tasted. Over 20 years in the barrel (they rotate Sherries through a series of barrels so that each vintage is similar – taking some out, leaving some in, and adding the more recent vintage), this wine was smooth, with traces of coconut, vanilla and pear. Really special. This wine retails for 22€, or about $24 per 500ml bottle. Then, my two tapa arrived. The first, a cod in a sauce that include coconut milk, was an amazing sensation of flavor. The second, pork belly, slow cooked and then the fat removed and a slice of pork chorizo inserted, accompanied by fennel and an apple puree. Amazing! The kitchen here is wonderfully creative and executes that creativity beautifully. To accompany those, Àngel suggested a 2008 Mauro “Sin D.O.” from Castilla y Leon, made from 88% Tempranillo and 12% Syrah. The wine was a decent pairing with the cod (the coconut made it tricky), but perfect for the pork belly. Then, to round of a great experience, Àngel brought out two local digestifs. They retail for about 7€ for a ½ bottle. Both were nice, if not exceptional. My tab for the whole thing was 50€. I know that a couple of things were comped. One of the more expensive evenings I’ve had in Màlaga, but a bargain anywhere outside of Spain. So if you find yourself in Màlaga, find Los Patios de Beatas and have a great wine experience. I was solo on this trip, as Dorianne is out of town – so I will be taking her there when she returns. As always, your comments on all things Spanish and/or wine are welcome. On a recent visit to New York to visit our daughter, Grace, we decided to purchase a starter case of wine for her and to set up an account at a wine shop. 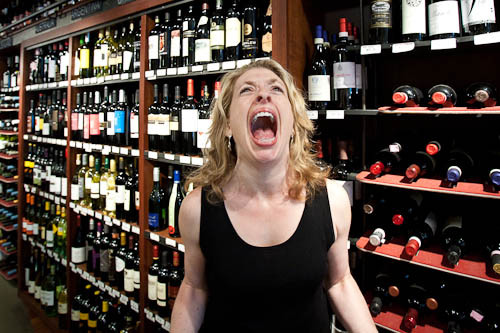 There are a number of very good wine shops in Manhattan, as you might imagine. We chose Union Square Wine Shop (LINK) after some online and in-person research, because of proximity to Grace’s school, a good selection of value-priced wines, and free delivery in the city when you purchase $95 or more worth of wine. Grace, at 22, has developed a pretty good palate. She has been to France a few times and enjoys French wines very much, especially Bordeaux blends. My thoughts in filling the starter case were to take that preference into account and expand her experience a bit with reds, plus add some whites and rosès since summer is just around the corner. I also wanted to keep the prices under $25, being mindful of the budget of a starving aspiring Broadway star. After discussing our goals with some of the sales staff, we (Dorianne, Grace and I) began to fill the case. I wanted to find some French wines that she would like first, which we did – one Bordeaux red blend, a Pomerol, two Sancerres, a Burgundian Chardonnay, and a wonderful rosè from Tavel, the only French A.O.P. that produces Au Bon Climat only rosès. To this, we added a reliable California Pinot Noir from, a favorite of ours; a nice Oregon Pinot Noir to compare to the Au Bon Climat; a wonderful Rhône-style blend from Tablas Creek in Paso Robles; a Spanish Tempranillo blend; an Italian Barbara d’Asti and a Nebbiolo from Langhe; and an Australian Shiraz. There is nothing here from Germany or eastern Europe, no New Zealand or South America, etc. Fortunately, Grace has a long future to explore these and other options as she chooses. Now, you can argue with any or all of these selections, but this starter case was built with some preferences in mind. That is the idea – you decide the parameters of the selections and then you find the best representatives of those parameters based on availability, price, and certain intangibles. Our bias was toward France, with an additional parameter of expanding outward from there and focusing on the Old World with some New World representation as well. That is a lot to cover in twelve bottles. My suggestion to her was to make tasting notes of each wine as she drinks it and then replace bottles with a balance of things she likes and things she would like to try. Having a set of preferences helps when she is at a restaurant or a party and there are a variety of options. She already knows to steer clear of the bulk wines and the cheap “critter wines” that populate lots of party bars among people her age (and, unfortunately, people my age as well). To create your own starter case, for yourself or for your children, my suggestion is to begin where you, or they, are. Start with what you already like and populate part of the case with those wines, then expand outward from there. The value of a good wine shop is that they will have staff who can make good recommendations – something you will not get at most supermarkets or places like Target and Costco (with some exceptions). I can’t overemphasize the importance of finding a wine store employee or owner who you feel comfortable with. I was recently in an independent wine shop in Baltimore that stocked many wines with which I was unfamiliar. When I asked for recommendations from the owner/manager, he told me that he could only help me with Kosher wines; “That’s all I taste,” he said. No one else in the shop had tasted any of the non-Kosher wines! Interesting business model. A good wine shop staff member will be of great assistance, especially when deciding what to add to your own preferences. He/she will have the experience needed to make recommendations that are very similar to those, or that are different enough to give you a new tasting experience. 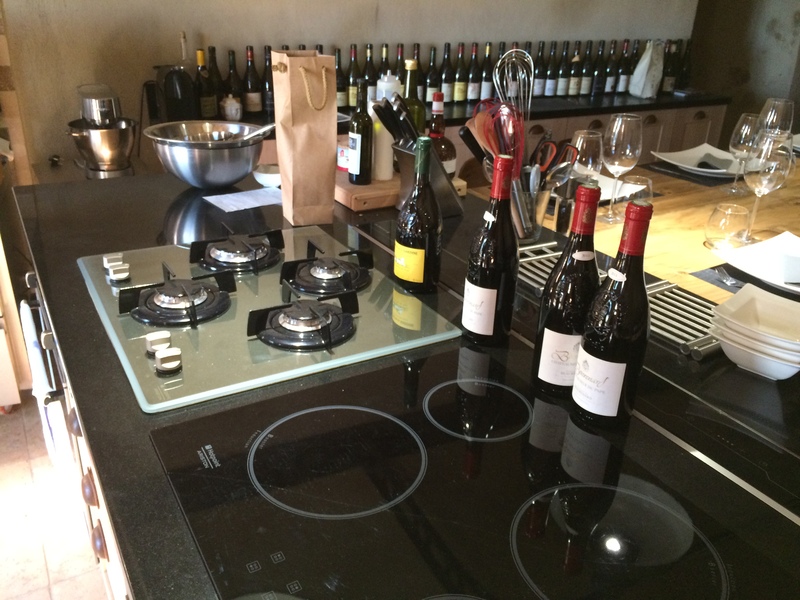 Good wine shops will also have tastings that you can attend to expand your wine experience. It is important that you be clear about what you want. Don’t let the sales staff give you a wine that you are not interested in, or one that is too expensive for your budget. Keeping these things in mind, creating a starter case can be a really great experience. Your comments, as always, are appreciated. I would add that many of the same reasons hold true when you are visiting domestic wineries – good values, wines that are not otherwise available due to limited production, and knowing the provenance are also reasons to buy at the winery in California, New York, or Virginia. Tasting at LaFond Winery in the Santa Rita Hills of California. Dorianne and I will be visiting California’s Central Coast twice in the next two months, and Napa-Sonoma-Mendocino areas early in the new year. We are looking forward to tasting and buying some amazing wines. Me Tasting at Broc Winery in Berkeley, California. 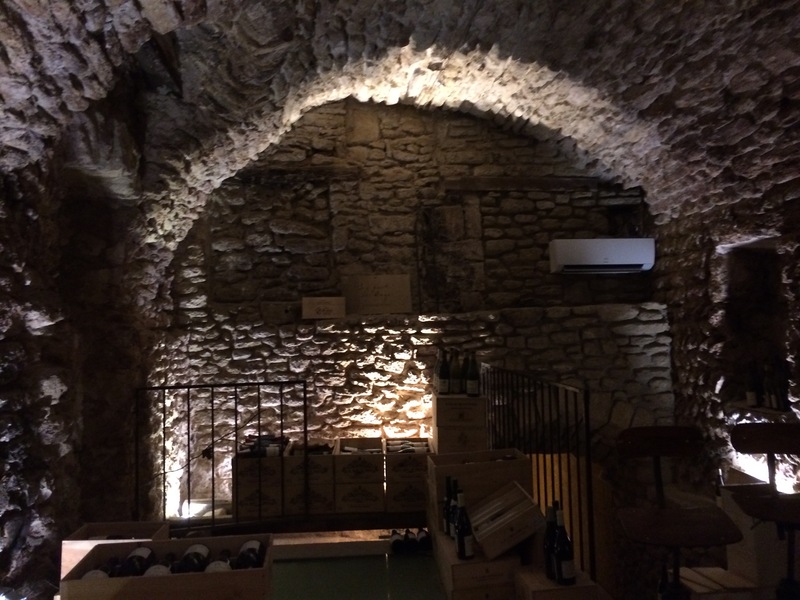 This past Saturday, Dorianne and I returned to Châteauneuf-du-Pape (LINK) for lunch and a tasting at a wine cave – a retail wine store. 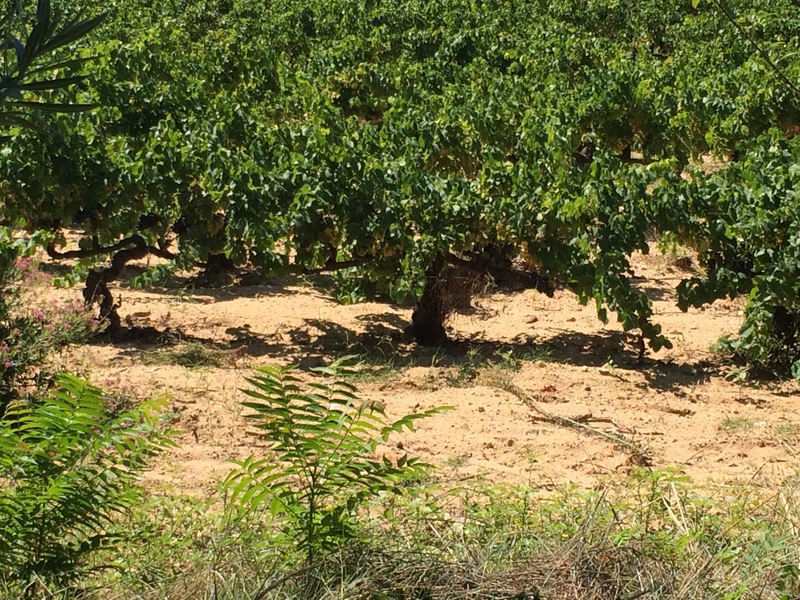 It was a beautiful day, and we drove through the lovely Provençal countryside, with its vineyards, orchards, scenic homes and farms, and lush vegetation. Our friendly GPS took us along about 5 kilometers of single-lane road through vineyard after vineyard before we entered the town of Châteauneuf-du-Pape, the most storied Appellation (LINK) of this part of France. Lunch was at Restaurant Le Pistou (LINK) on a little side street off of the main town square. 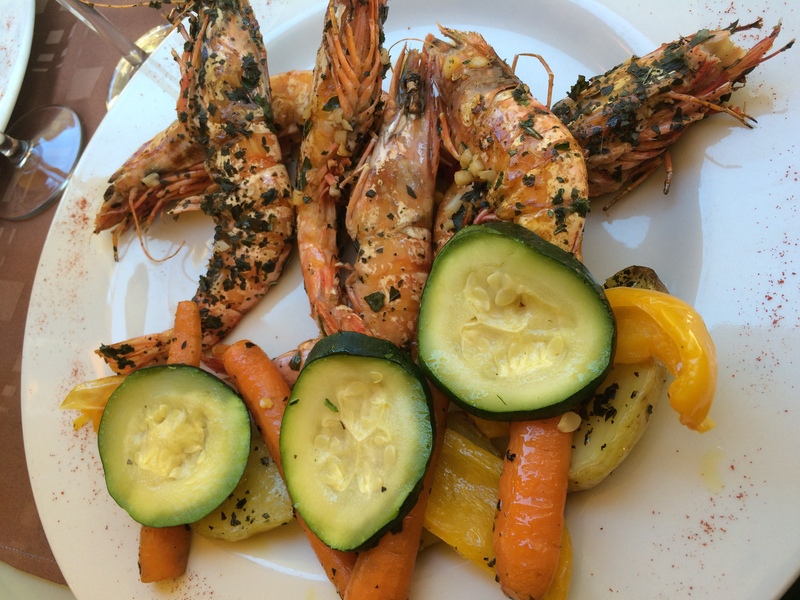 We sat outside and expected a light lunch, but the servings were very large – gambas salad for Dorianne, and grand gambas with salad and vegetables for me. As you can see, the plates were sizeable. We washed this down with the house white – a Châteauneuf-du-Pape. Before this trip, I did not know that whites were made here – but they are, compromising about 6% of the total production. 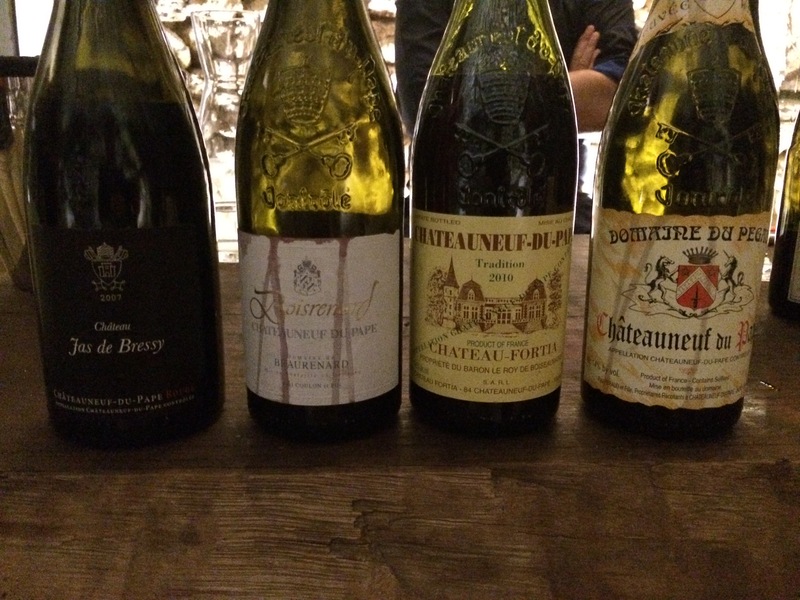 The whites of Châteauneuf-du-Pape stand alongside the storied reds as excellent wines. Le Caves Saint Charles (LINK) was highly recommended in Tripadvisor.com (LINK), which we used as a means of sorting through the dozens and dozens of caves du vin in the town of Châteauneuf-du-Pape. We wanted to ensure that we were tasting really good wines. After deciding, we made an appointment via email to meet the owner, Guy Brèmond, for 3:30 pm. We were a bit late, having had some trouble locating the cave – our GPS being little help – and in finding a place to park. When we arrived at the cave, which is at the top of the highest hill in town, only overlooked by the nearby ruins of the original Château of Châteauneuf-du-Pape, it was locked up. We knocked on the door to no avail. We called the number, and did connect. It turned out that Guy was later than we were, having been stuck in traffic in Marseilles earlier. After a few minutes, we were in the temperature controlled cave, which is under the home of the owner. 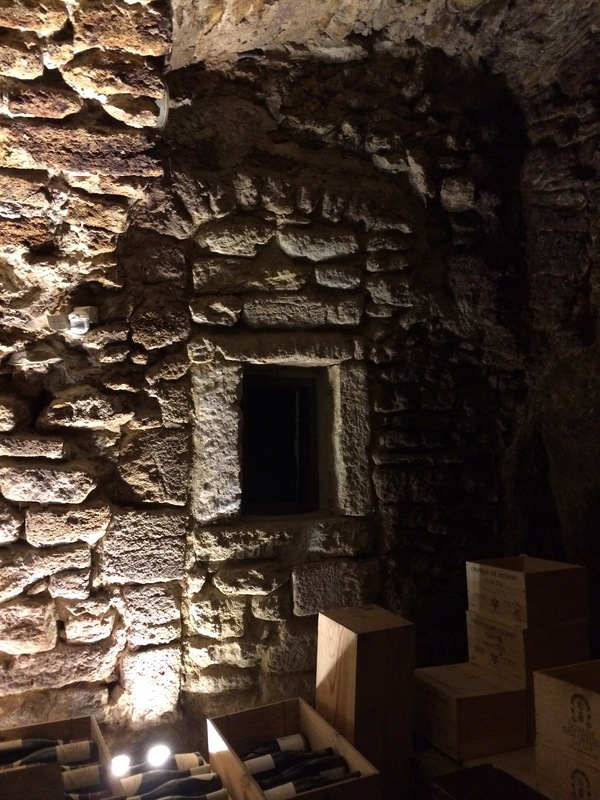 The actual cave structure of Le Caves Saint Charles dates from the 13th Century. There is another section underneath that dates from the 12th Century that is going to be renovated in the coming year. 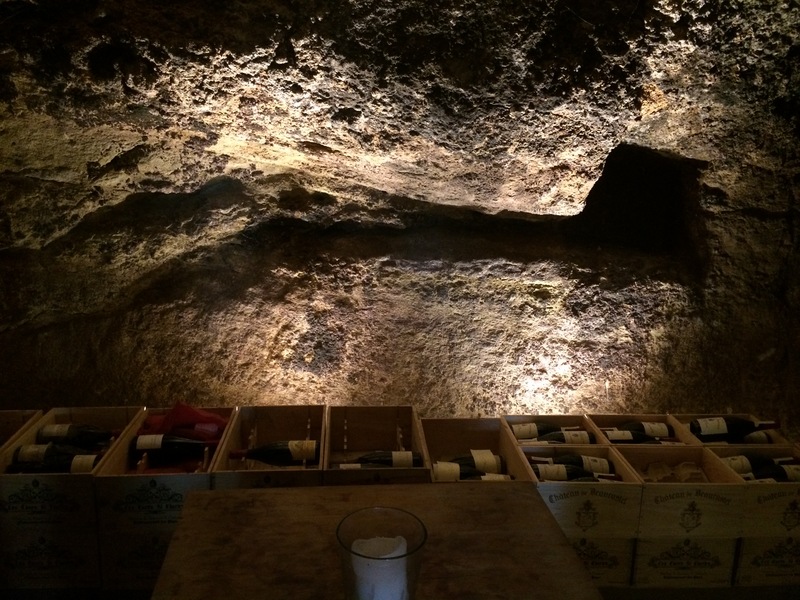 The cave in use has four rooms carved out of the rock with stone walls and vaulted ceilings – a lobby area, the tasting area, a small storage area and an area converted into a modern kitchen. There are bottles of wine in wooden boxes from the 45 producers that Guy represents throughout the cave rooms. We started in the tasting area. Guy Brèmond is a Master Sommelier and a very personable and outgoing man. Once we established that Dorianne and I knew something about wine, although not that much about Châteauneuf-du-Pape, we were off and tasting. He spoke in depth about the philosophy and history of the appellation, and about the way the wines are made and the misconceptions that many have about Châteauneuf-du-Pape. We tasted 8 wines, two whites and six reds. The reds were made in three different styles, or methods. The 90 minutes or so that we were at Le Caves Saint Charles with Guy Brèmond went by quickly. I kept having the feeling that this was a really special experience, and it was. The depth of his knowledge of wine in general and Châteauneuf-du-Pape wines specifically, combined with his enthusiasm, was a bit hypnotic. I will share now that we did purchase a mixed case of wine at the end of our visit to have shipped to California; but we were intending to do that when we arrived, if the wines were good. Guy is a very good businessman, but there was no pressure to purchase beyond what may naturally arise when you are in a fabulous environment, tasting exceptional wines, with an enthusiastic and knowledgeable host. We began with two whites. As I said, I was surprised to find whites here, as I have never seen them in the U.S., nor read about them. We had tried a Mont-Redon Châteauneuf-du-Pape white shortly after arriving here in Provence and found it delicious. First, we tasted a 2012 Domaine de Nalys Blanc (LINK) (LINK), a blend of 40-56% Grenache blanc, 14-34% Clairette, 13-27% Bourboulenc, 3-10% Roussanne, 1-5% Picardan, 1-3% Picpoul. 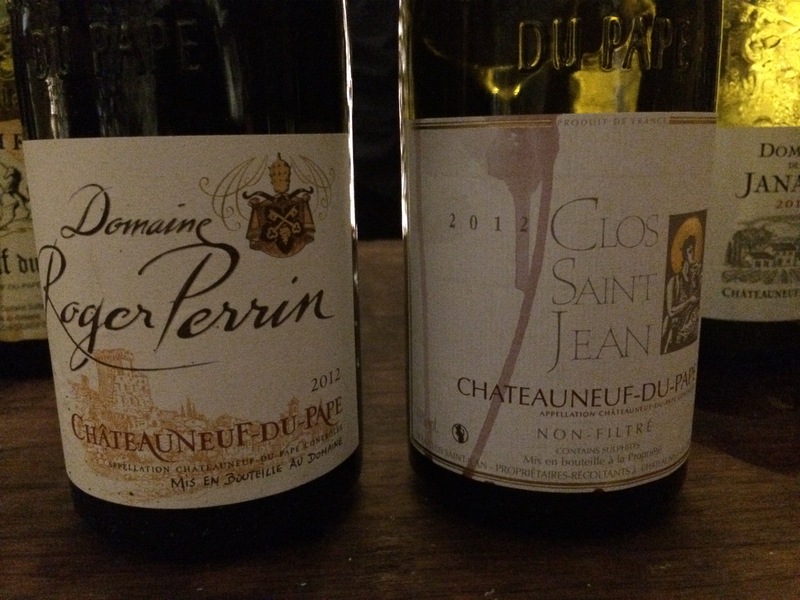 The white wines of Châteauneuf-du-Pape are, like the reds, complex. This wine gives you a lot to experience on the nose, in the mouth, and through the finish. There is green fruit, minerality (always), some floral notes on the nose; apple, pear, and hints of earth and anise on the tongue; with a smooth lingering finish that returns to the mineral notes from the bouquet. This wine would be exceptional with lighter cheeses and seafood – oysters and shellfish in particular. We bought 3 bottles at 31€ and change. 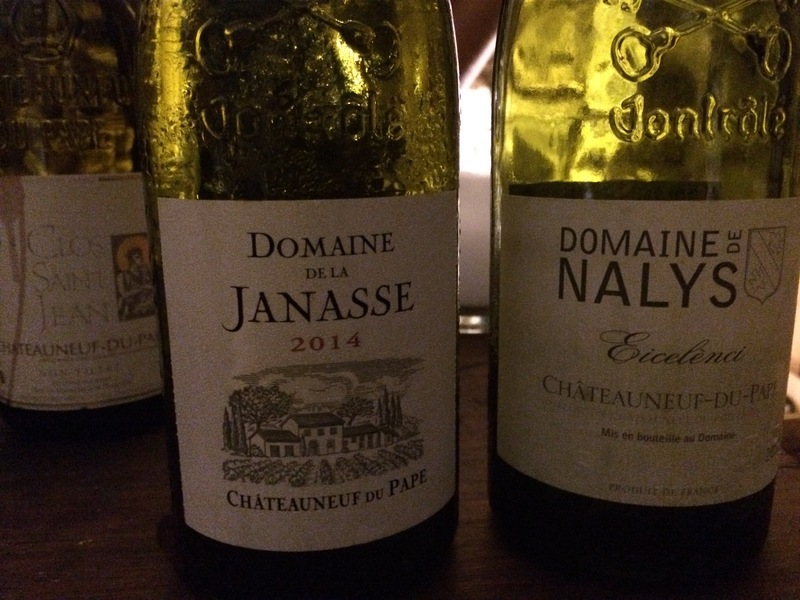 Next, we went to the 2013 Domaine de la Janasse Châteauneuf-du-Pape Blanc (LINK) (LINK), a blend of 40% Grenache Banc, 40% Clairette, and 20% Rousanne. This is a beautiful wine from one of the most highly regarded producers in Châteauneuf-du-Pape. A wine that is very drinkable now, but should age well. The nose is peach and floral, but with that ever-present minerality; mouthfeel is rich and viscous with hints of vanilla; long, smooth finish. We bought 3 of these, too, at 34€ and change. (That’s half a case so far.) I think that we will continue to explore the whites of Châteauneuf-du-Pape; in fact, I am certain of it. As we move to the reds, I should point out of few things (this will be a rather long post). As we taste, there is a lot of conversation going on. Dorianne is full of questions. I ask a few myself. Guy Brèmond is expounding on each wine, each producer, their philosophy, their practices, the market, his business, and more. It is quite lively and very interesting. Many people do not know about the white wines, as their small production limits their distribution. Many believe that all Châteauneuf-du-Pape reds come from thirteen varietals. There are, depending upon who you speak to, anywhere from 14 to 18 varietals in the appellation. Some do not count the white varietals other than Granache Blanc. Others count only some of them. So there are, essentially 13 varietals of red, but some of the white varietals may be blended into the red wines. The appellation currently allows 18 varietals under a Châteauneuf-du-Pape label. 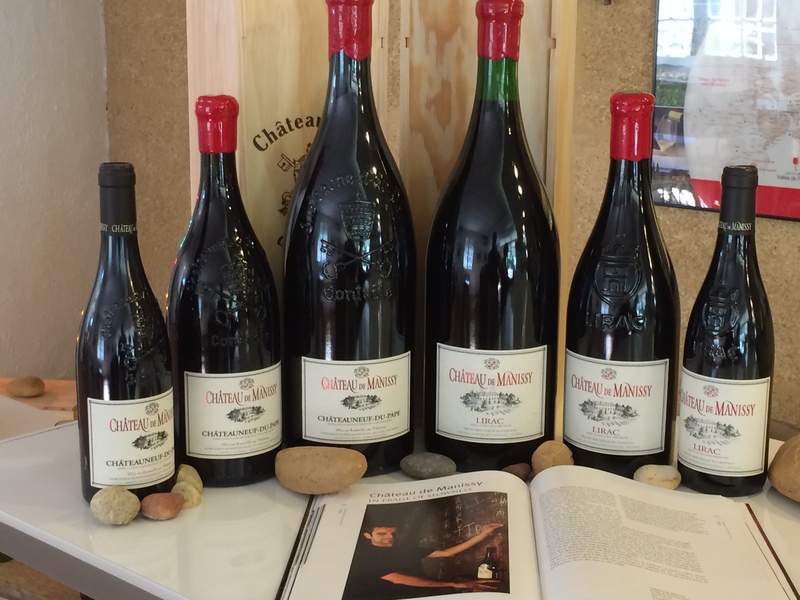 Many believe that all Chateauneuf-Du-Pape reds must be blends. This is not true. For example, you can have a 100% Granache, which we have tasted (not at the Cave). Most reds are a blend of three to five varietals. The basis for almost all Châteauneuf-du-Pape reds is the classic GSM Blend – Granache, Syrah, and Mourvedre. Why so many varietals in a small appellation? Guy says that it was because when the appellation was developed and the rules created in 1923 (amended in 1936 and 2009), all of the varietals under cultivation at the time were included. This “democratic” move forestalled the inevitable infighting that might have jeopardized the pact. The Traditional, Modern & Neoclassical styles – “Much of the difference between traditional and modern, is the ripeness of the grapes, effective yields, amount of stems used and most importantly, the percentage of new oak barrels used in aging the wine. Producers making wines in a more traditional style do not use oak, preferring to age the wine in older, neutral, massive barrels, cement lined vats or foudres that are widely used in the region. They do not destem the grapes. In other words, they follow the traditional practices of the region. 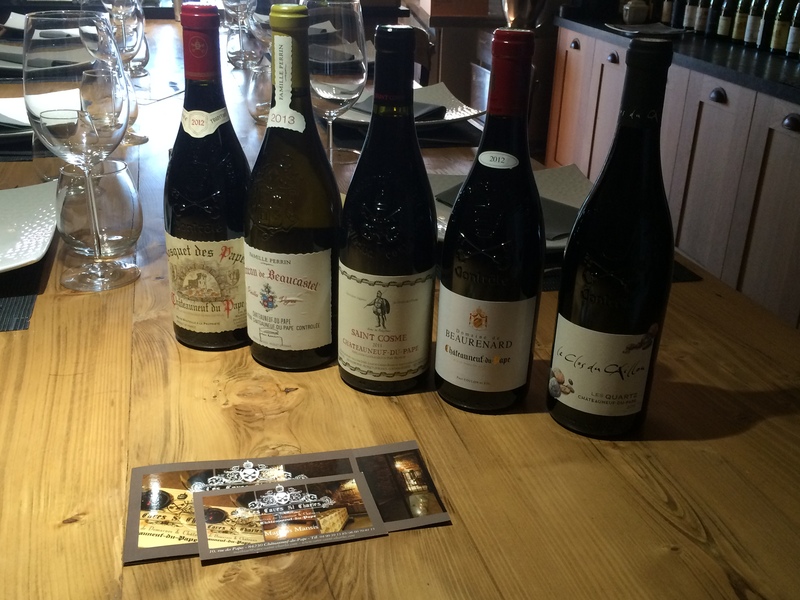 There are numerous high quality traditional Châteauneuf-du-Pape wines made all over the appellation today” (LINK). So the use of smaller oak barrels designed to impart its characteristics onto the wine is a hallmark of the Modern Method. The Neoclassical Method is a hybrid of the other two, some oak barrels are used, but only for a portion of the harvest. The Châteauneuf-du-Pape Modern Method Reds. First, a 2012 Clos Saint Jean “Vieilles Vignes” Châteauneuf-du-Pape (LINK), a blend of 85% Grenache with the remainder a mix of Mourvedre and Syrah (Guy says that Syrah is used only for “cosmetic purposes” – to provide a richer color). This is a big wine, full-bodied, with deep red fruit and minerality on the nose and the palate. A wine that will age well, I think. If this is typical of the Modern Method, it is very much like a California or New World wine – bold, high alcohol, fruit forward. In my research, I noticed that Robert Parker generally gave higher marks to Modern Method wines. The next Modern Method wine is a 2012 Domaine Roger Perrin Chateauneuf-du-Pape (LINK) the website lists an average blend of 70-75% Grenache, 15-20% Syrah, 10-15% Mourvedre, 2-5% Cinsault or Clairette and 1-2% Counoise or Vaccarese. Another big, fruit-forward wine. Dark red fruit, a bit of mushroom on the nose, minerality throughout. Very similar to the Clos Saint Jean, but with a bit more finesse. The Châteauneuf-du-Pape Neoclassical Method wine (Left) and the three Traditional Method Reds. First, a 2010 Domaine du Pegau Châteauneuf-du-Pape Cuvee Reservee (LINK), a blend of 80% Grenache, 6% Syrah, 4% Mourvedre and 10% other varietals. 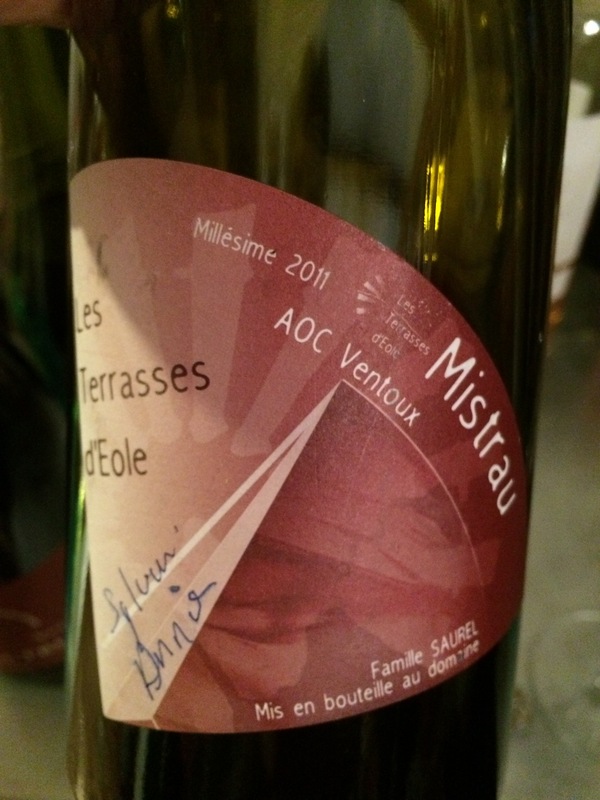 This is an amazing wine – you can immediately see the difference between this method and the Modern Method – something that would carry through with the rest of the wines tasted. It is more mineral than fruit, more elegant than bold, with a beautifully balanced structure of tannins. This is my style of wine. But we did not buy this one. Next, a 2010 Château Fortia Châteauneuf-du-Pape Tradition (LINK), a blend of 65% Grenache, 20% Syrah and 15% Mourvedre. Aged in foudres (concrete tanks). This wine is pretty much everything that the Domaine du Pegau is, but it takes it to a higher level, but is very much its own wine. You get some barnyard on the nose, which begins to dissipate after a few minutes, but remains. I did not find it off-putting, but some may. There is ripe fruit in there, but it is subdued in a minerality – dirt, terroir – that permeates the wine. On the palate it is very nicely structured and balanced and the fruit began to come through. This is a wine that will age well and one that would benefit from decanting. We bought 3 of this one at 35€. Next, a 2010 Beaurenard domain Cuvee Boisrenard Chateauneuf-du-Pape (LINK), a Grenache blend but the winery does not release specifics as far as I can tell – only that up to 13 varietals may be included in the wine. Parker 91, Wine Spectator 97 points. A long, smooth finish. The initial tasting bottle had been opened too long, Guy opened a new bottle and got us clean glasses. This one, too, could benefit from decanting a while. We probably would have bought some of this wine, too, but a case was our limit, and we couldn’t pass up the next wine. Finally, a wine in the Neoclassical Method – meaning a mixture of traditional and modern. A Château Jas de Bressy Châteauneuf-du-Pape (LINK) (LINK), a blend of 80% Grenache; 15% Syrah and 5% Mourvèdre. This wine has lots of mushroom on the nose and a nice peppery sense as well. Fruit is secondary to the minerality on the palate, plus a sense of chocolate. The tannins were there to ensure a relatively long life for this wine. A very nice wine. We added three of these at 36€ and change to round out our case purchase. After our tasting, we had a quick tour of the rest of Les Caves Saint Charles with Guy Brèmond. There is another small storage room in the cave and a modern kitchen also where gourmet dinners are prepared to pair with these amazing wines. Guy also takes his act on the road, bringing dinners to private homes in the U.S. with a Michelin-Star chef. You can find out more about this at his website (LINK). This experience has been the wine highlight of our six weeks in France. I am very grateful to have discovered so much about the joys of Provence, and the wines of this amazing region. Guy in the kitchen. Behind him is a terrace with an amazing view. Some of the Cave wines in the kitchen. Every Chef needs some Wine for Cooking – and for the Cook! I haven’t posted in a while, because Dorianne and I have been focusing on some writing projects and dining in our apartment for the most part. 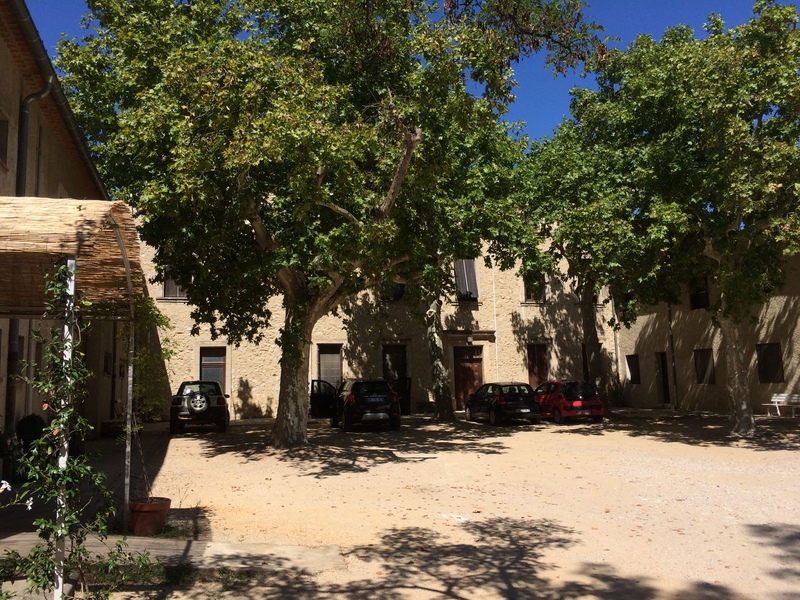 We are sill in Villeneuve-les-Avignon, the picturesque village across the Rhône River from Avignon in northern Provence. 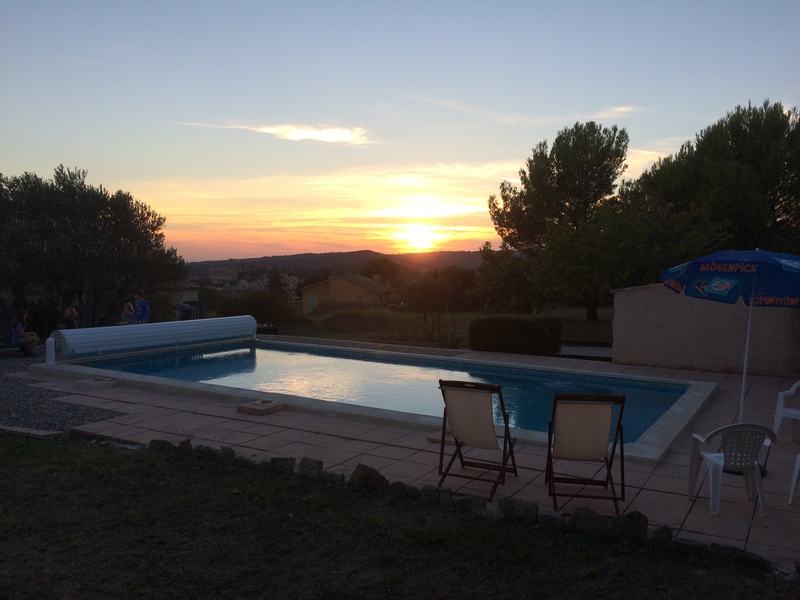 This weekend, we were invited by our friend Richard Major, who lives in Mazan in the Ventoux region, to a party being hosted by an ex-pat American couple celebrating one year of living in France. There would be ex-pats from the United Kingdom, New Zealand, and other nations, plus a few French neighbors. So, of course, we were interested in attending. I won’t use any names here, because I did not get permission to do so. Here is the sunset from the home. The home was located in the hills above Bédoin, a picturesque (they are ALL picturesque) village near the base of Mont Ventoux. The couple, from California, and their two children seemed very happy with their choice to move to Provence. We also spoke with a number of other ex-pats and a couple visiting from the U.S., also from California, who own a home nearby, but still live in the States. The dinner was pot-luck, and there was a good bit of local wine. The Ventoux Region (LINK) is known for Grenache, Syrah and Mouvèdre, with Cinsault and Carignan – the usual Rhône Valley suspects. In the Ventoux A.O.P., no varietal can be more than 30% of the blend. Here are some images of some of the wines served at the party. Suffice to say, Dorianne and I were impressed by the lifestyle and the conviviality of the English-speaking ex-pats in this part of Provence. It gave us more food for thought about our future home base. 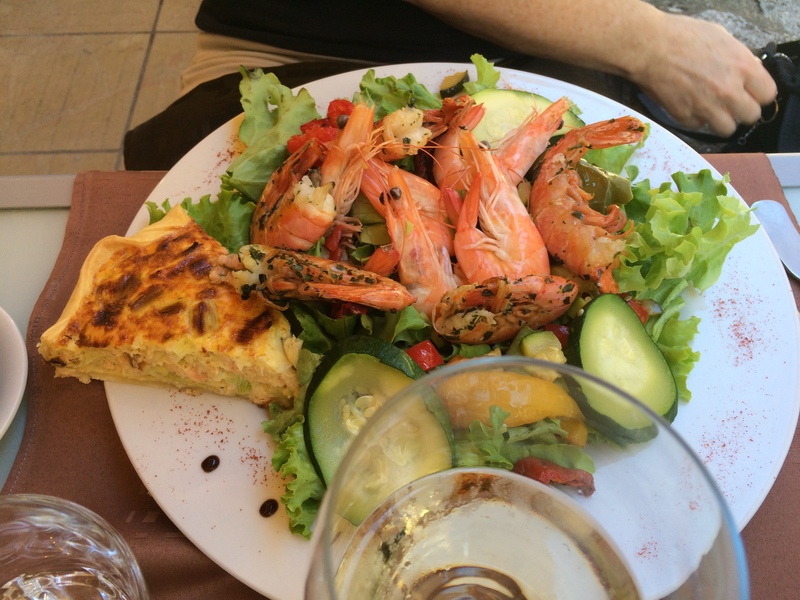 After an overnight at Richard’s in Mazan, we headed for a day in Tavel, the only A.O.P. in France where only rosè wines are allowed; and then over to Châteauneuf-du-Pape for lunch and a visit to Les Caves St Charles, which will be detailed in a separate post. It was a very special day. If you stay off of the highways, this part of France is a treat for the senses – beautiful panoramas of low hills, valleys, fields of grapes and olive trees, rustic farmhouses – simply beautiful. We traveled down one-lane roads through vineyards and tiny villages, smelled the aromas in the air, and heard almost nothing – silence. It was a very peaceful way to travel. Tavel (LINK) is located on the right bank of the Rhône River, bordering the Lirac A.O.P., and very close to Avignon. First, let’s look at A.O.C. and A.O.P. The French government, not too long ago, officially announced that the long standing A.O.C. (Appellation d’origine contrôlée) system for wine is being replace by an new quality ladder with the top step being an A.O.P. (Appellation d’Origine Protégée) (LINK). So, since about 2009, the correct designation is A.O.P. – – That’s just F.Y.I. We chose Château de Manissy (LINK) in the Tavel A.O.P. from a list online. We are very glad that we did. Owned by the Holy Family’s Missionaries, it has produced rosè wines since the beginning of the 20th century and acquired a famous reputation with the “Tête de Cuvée” wine, a barrel-aged rosé. The monks turned over the viticulture and wine-making to a young many from Tavel, Florian André, who was in his early 20’s at the time. Monsieur André has continued some of the traditions of the monks, and oversaw the conversion to an organic winery in 2009. 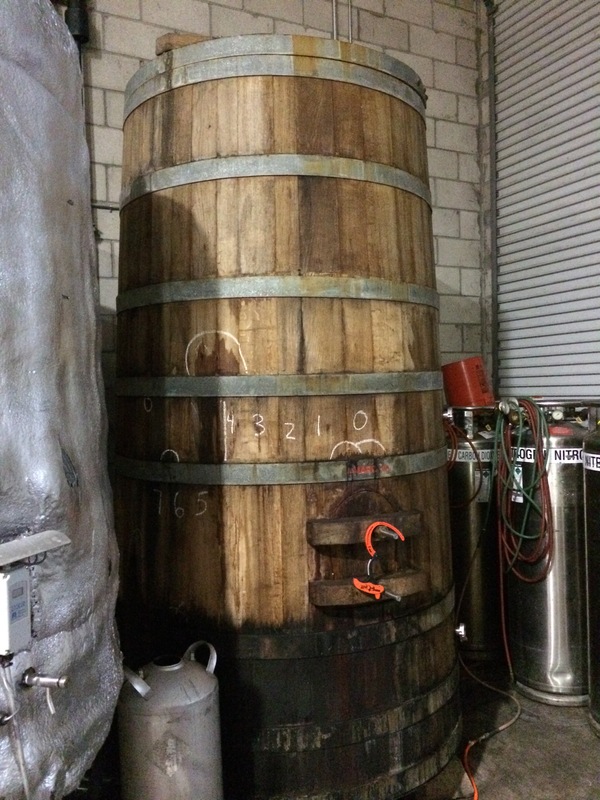 He has also modernized some of the techniques, while keeping that barrel-aged rosé in production. By the way, the monks still live in the Château. We arrived a bit early for our 2:00 pm appointment, so we wandered the grounds a bit before being met by Anaïs, the Tasting Room Manager. She took us out to the vineyards and we discussed the viticulture of the region. It turned out that her English was so good because she spent a year (2013) working at Tablas Creek Winery in Paso Robles, known for their Rhône varietals and techniques. As it happened, Dorianne and I were in the Tablas Creek wine club in 2013. Anaïs told us that her father is the winemaker at Famille Perrin/Perrin & Fils in Tavel, and they partner with Tablas Creek in a number of ventures. Small world. 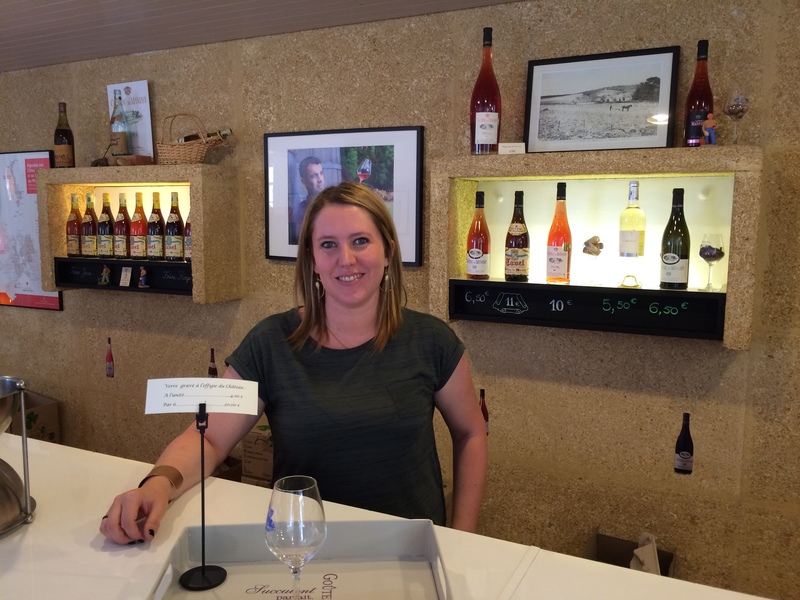 Anaïs – Tasting Room Manager. 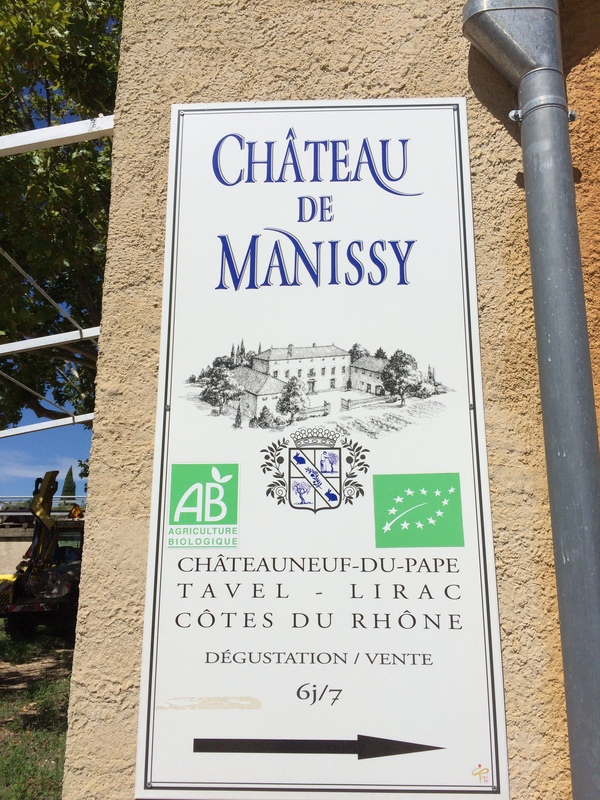 Manissy’s Chateauneuf-du-Pape – from a Single Hectare Vineyard. 100% Grenache. It also turned out that our guide on a previous tour (LINK) of Châteauneuf-du-Pape and Gigondas, Valentina of MistralTour.fr, used to work at Château de Manissy. Smaller world. We did a tasting and then toured the wine-making operation. First, we tasted a white from another area of vineyards and a Côtes du Rhône – Rosé of Grenache 40% – Carignan 40% – Cinsault 10% – Syrah 10%. This wine, not from 100% Tavel fruit, was closer to the rosé wines of the larger Provencal region. It was lighter and crisper than the wines to follow. 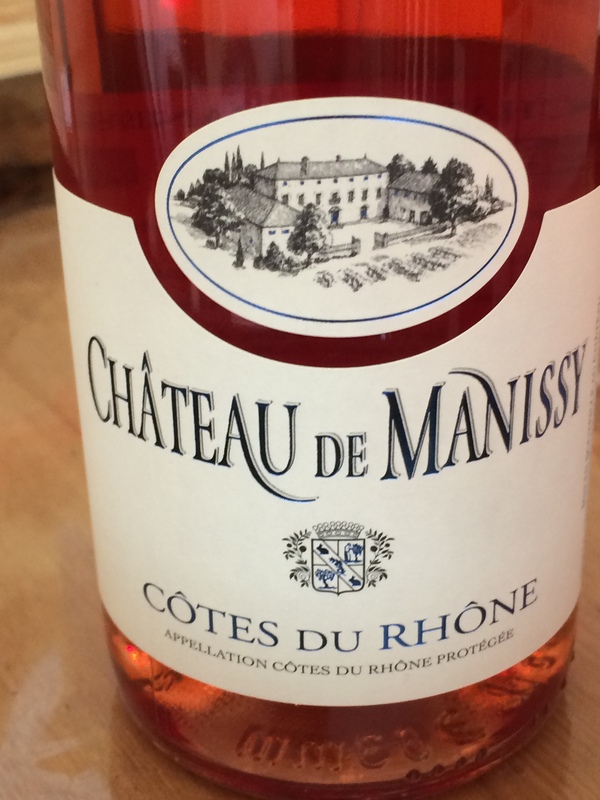 They also make some other wines from vineyards outside of Tavel, all were good and very reasonably priced, but they are not why you want to visit Château de Manissy, or the wines you want to try. 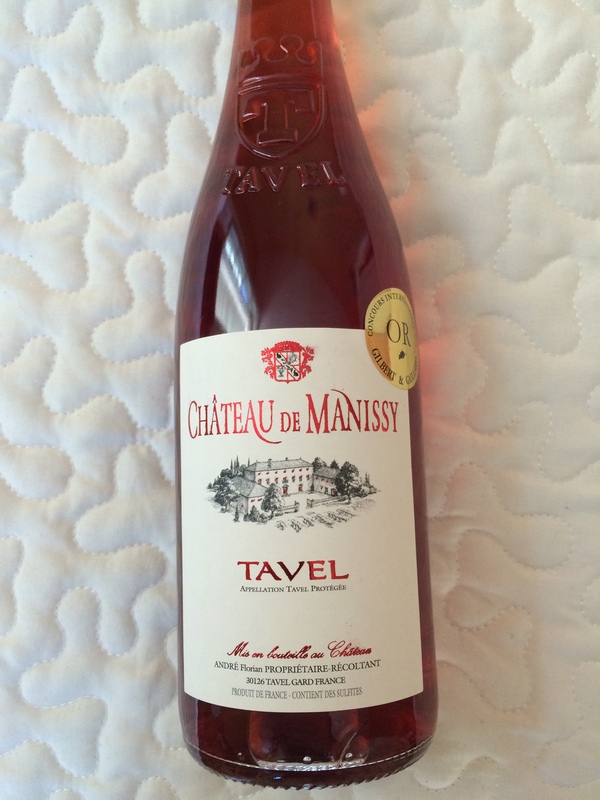 The rosé wines of Château de Manissy, and of Tavel in general, are unlike other rosé wines from Provence. 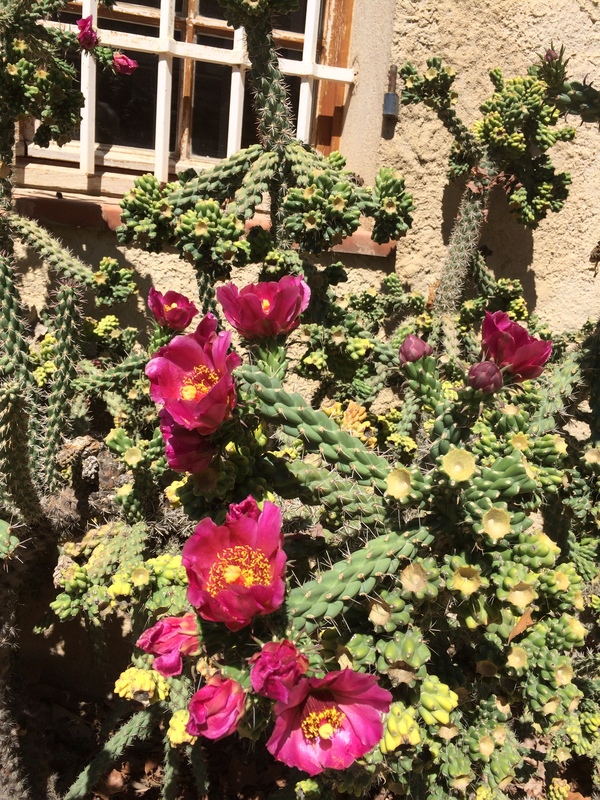 They tend to have a deeper pink to red color and be bolder. This is true of the 2013 Tavel Rosé that we tasted, a blending of principally Grenache, Clairette, Cinsault and Bourboulenc, from about 40 years old vines. This is a bolder, more structured rosé with a sense of terroir, unusual in a rosé. There is also a nice balance of fruit – this wine manages to be refreshing and structured enough to pair with chicken or other fowl. This wine is a good representative of the moden Tavel A.O.P. rosés. Then, we had the unique 2013 Tête de Cuvée, the barrel-aged rosé that is the last vestige of the monks’ style of wine making. This is a unique rosé in almost every respect. It is aged in small oak barrels, bottled in brown glass like a red wine, it pairs with beef and other meats, it is made to age for decades, and it is made to consume year-round. 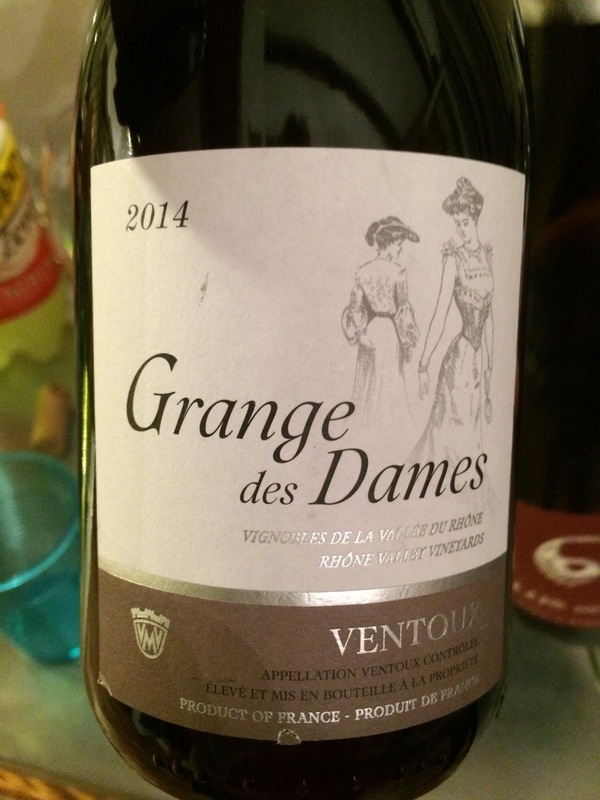 It is a blending of Grenache, Clairette, Cinsault, Bourboulenc and Carignan. It is mentioned but not listed for sale on their website, and there is very little information about this wine on the internet that I could find. This would be a wonderful wine for Thanksgiving Dinner, strong enough to stand up to turkey and gravy and such, but supple enough to match pretty well with all the other appetizers and side dishes that show up at that feast that is so hard to find good wine parings for. We have two bottles that will travel home with us for this purpose. Oh, and the 2013 Tête de Cuvée was priced at 11€ or about $12.00 – one of their more expensive wines! It is also worth noting that Anaïs told us that we were the very first visitors in 2015 from the United States. 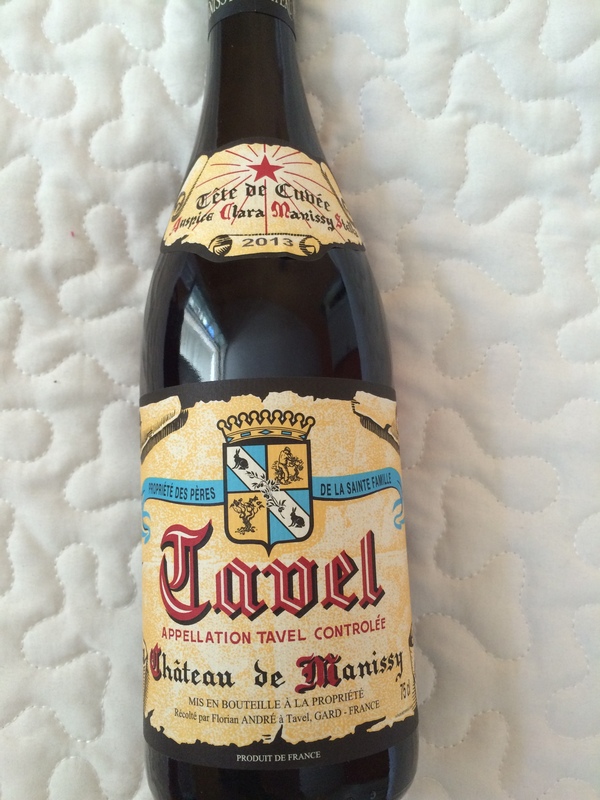 I found this surprising, but then again, Tavel is not well known in the U.S. If you are looking for rosés for the remainder of the summer and into the cooler days of autumn – see if your wine retailer has wines from Tavel – you won’t be disappointed. 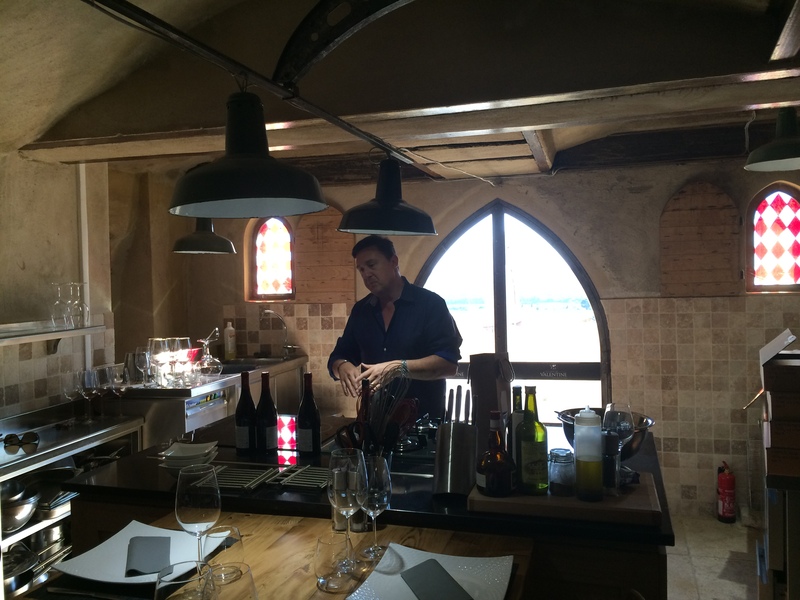 I will post about the other part of our day – a return to Châteauneuf-du-Pape, in the next post. Photos and text Copyright Jim Lockard 2015. WINE ENJOYMENT SHOULD BE ACCESSIBLE AND ENJOYABLE, OR WHAT’S THE POINT? There is a false notion that permeates wine culture at almost every level. That notion is that there is a level of knowledge that is attainable that will enable a person to know about every wine that exists. Now I know that most wine experts (a word that is past its expiration date IMHO) will say that this is not so, but it is conveyed in wine media of all kinds and by many individuals. My wine Twitter feed includes a number of people who purport to have a very deep knowledge of a very wide variety of wines. I have my doubts. The reason that this is a false notion is that the sheer numbers relating to wine have grown so large and are so widely distributed around the globe. 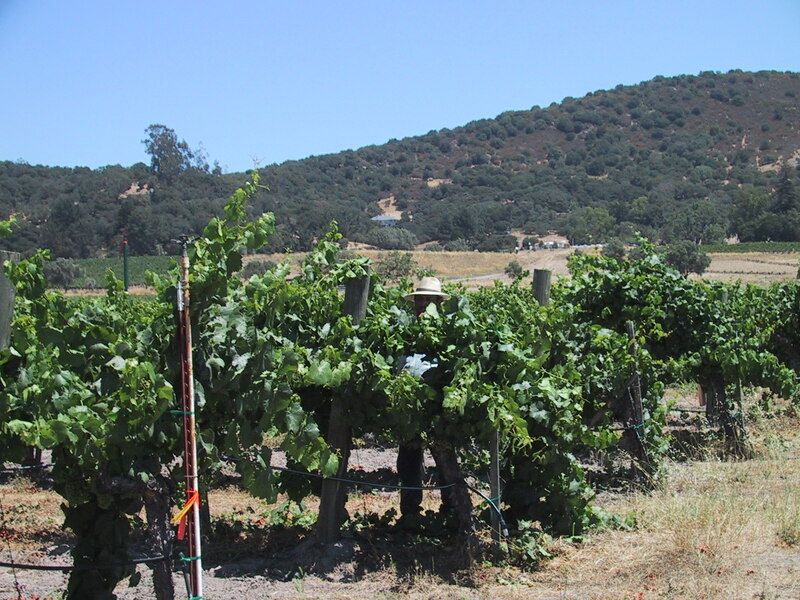 The California Wine Institute (LINK) has figures on its site for world wine production through 2012 – it shows 25,721,000 liters of wine produced world-wide (LINK). WineSearcher.com (LINK) shows about 3,600 wine regions in the world. There are probably around 100,000 wine producers in the world (this number is a bit difficult to nail down). The number of labels that you find in a decent wine store grows each year, with mega-stores like Total Wine and Spirits carrying upwards of 9,000 wines. How is anyone going to know about all of these wines? For someone who is new to wine appreciation, or even for seasoned collectors, it can seem impossible. Most end up narrowing down their focus to a few regions or varietals, or even a single one. I have a friend who only drinks Kendall Jackson Chardonnay for example. Most collectors focus narrowly, some are more expansive, seeking out a wide variety of wines from various locations, vintages, and varietals. Those who focus will likely have a more in-depth knowledge of the particular area or areas of their attention. Those who explore more widely will have a more superficial knowledge of a variety of wines, regions, and varietals. Unless you are in the wine business, you will not have time to taste and understand the thousands of wines that are out there, or even the hundreds on the shelves on your local wine retailer’s shelves. And even if you are in the wine business, it is doubtful that you will need to know about every region, varietal or producer. The idea that one needs to have so much knowledge can drive people away from the enjoyment of wine, and that serves no one. My recommendation is to find your own way into and through the many types, styles, and iterations of wine. You may just have a glass or two a week of whatever is being served, or you may be an avid collector of all things from the Piedmont in Italy or Napa Valley in California, it does not matter. There are ways for you to access information about your own desires and preferences. I tend to be an explorer. Even though I drink wine every day, blog about wine, and will be doing wine-related tours in the near future, I do not spend hours and hours pouring through information about wine. I tend to be an explorer – trying all kinds of wines from various regions – but I also have my preferences and I spend more time exploring those in greater depth as time and my wallet allow. Writers like Eric Asimov of the NYTimes work for me, because he explores a variety of wines from different places. 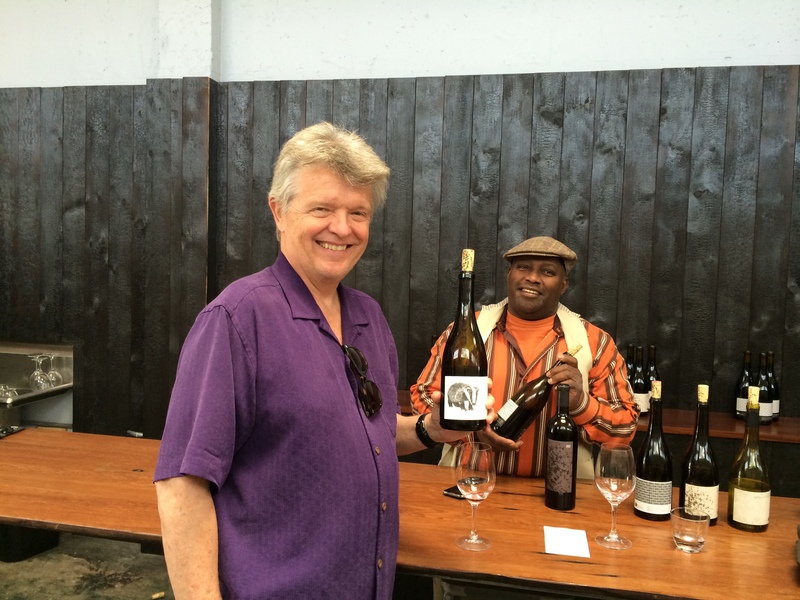 I also enjoy Kermit Lynch, the amazing wine purveyor in Berkeley, whose newsletter (LINK) is very informative and focuses mostly on French and Italian wines. But you will find your own sources. I try to keep my blog as general as possible, but since I travel a lot, I write about the wines and the wine culture where I travel, so there may be some posts that do not interest everyone. the world of wine should not be an impenetrable maze of secret or obscure or overwhelming information. It should be accessible, enjoyable, and allow each wine enthusiast to savor the experiences that he or she discovers. Whether that is a focus on First Growth Bordeaux or on trying to sample each of those 3,600 wine regions in the world, it should be an enjoyable experience, or what’s the point? I would love to see some comments on this post – what do you think? What is your approach to wine? A very good article from WineFolly.com with infographics on the appellation systems in the United States, France, Italy, and Spain. This is the kind of helpful information that wine buyers need to help decide what to purchase, especially when you are looking at wines with which you are not familiar. There are “click-throughs” to other information as well. 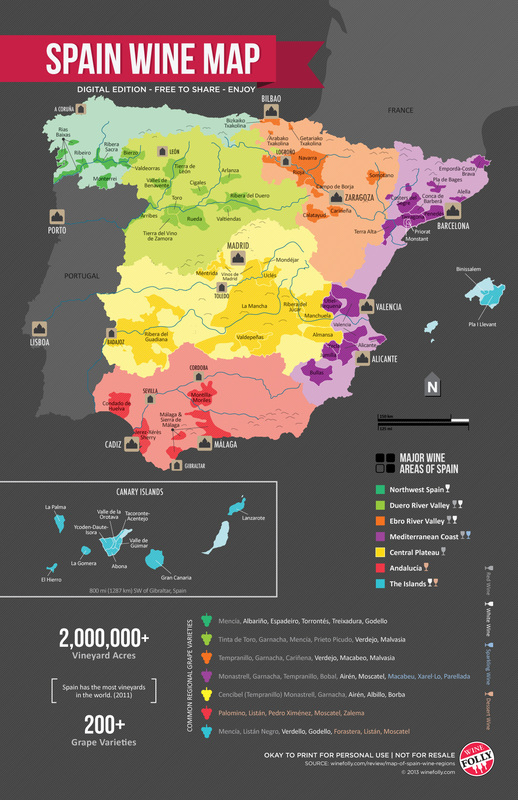 The Spanish Wine Map below is one example from the article (click on it in the article and you go to another excellent article about Spanish Wine). 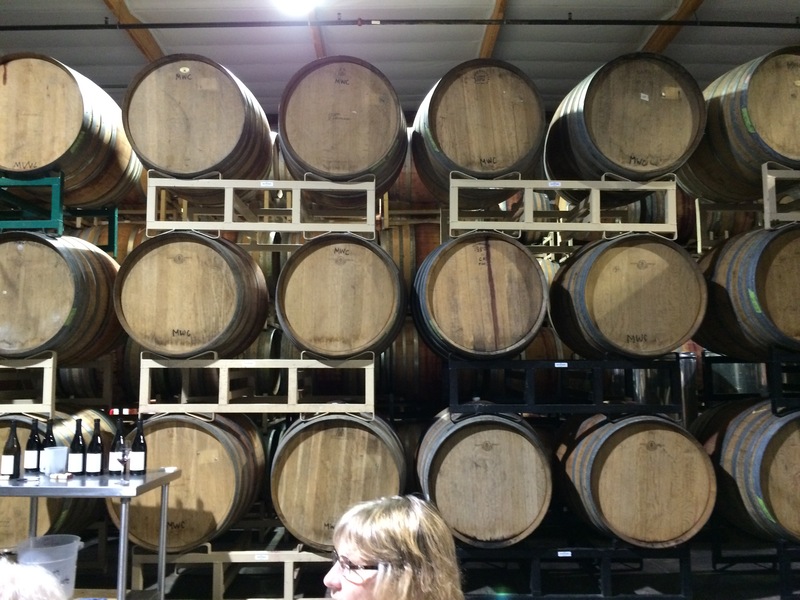 Continuing our series on the wineries I visited on a group wine tour in the Santa Rita Hills Appellation on Saturday, we will take a look at Margerum Wine Company (LINK). Our group tasted at the winery near Buellton, but the regular tasting rooms (LINK) are in Santa Barbara. 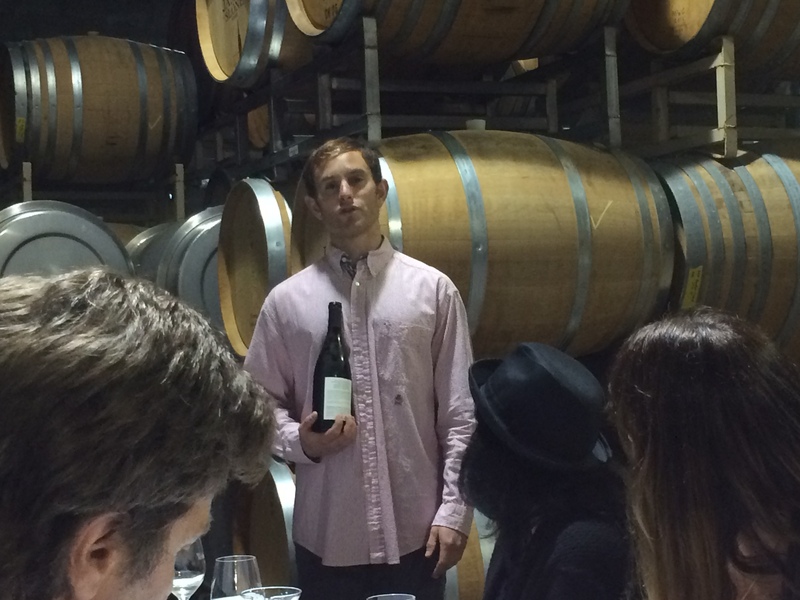 Assistant Winemaker Sam Smith conducted our tasting on Saturday. Sam Smith describes Margerum Wines. 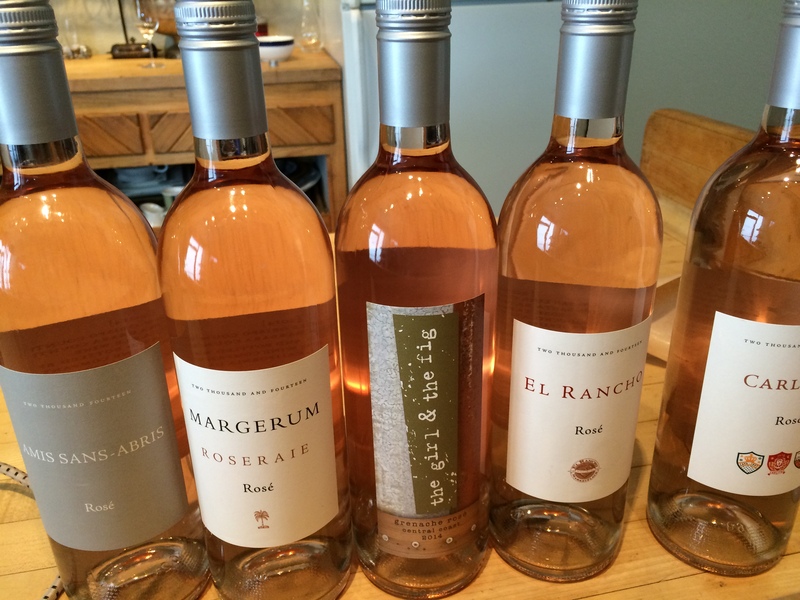 Margerum produces a number of wines from a variety of vineyards (LINK) in Santa Barbara County. They produce small quantities of each wine, seeking to maximize the quality. Their stable of wines runs from Sauvignon Blanc (including a rare late harvest dessert version), to Pinot Gris and a Grenache Rosé on the white side, with Syrah, Pinot Noir, Grenache, and Rhone and Chateauneuf-du-Pape style blends under a couple of labels. You can read about each of the wines at the link above. I really enjoyed the 2013 LATE HARVEST SAUVIGNON BLANC, a very light and smooth dessert wine that has a light mouthfeel and not too much sweetness. I found the wines we tasted to be well-crafted with a tendency toward lightness and elegance, even a sense of understatement, which is consistent with the style that many winemakers adopt in this region. As noted in earlier posts, if you want the big fruit-bomb reds, you need to head north a bit to Paso Robles, where that style is more prevalent. The owners of Margerum Wine Company are also involved in the Wine Cask Restaurant (LINK) in Santa Barbara. The restaurant has an excellent reputation, and, I am pretty sure, you can get some Margerum Wines on the premises. Later, more posts on the other two wineries we visited, LaFond and Tyler, each very interesting in its own right. 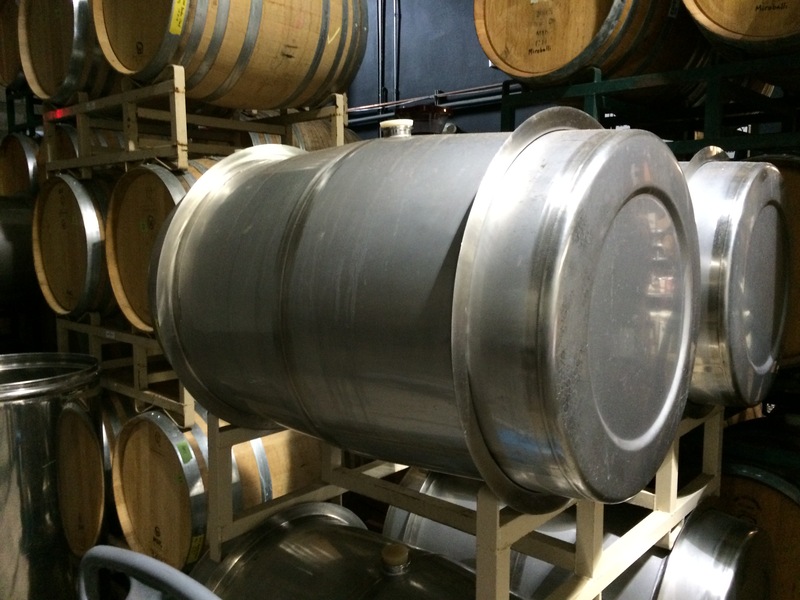 Stainless Steel Barrels at Mergerum. A Line Up of Rosés.